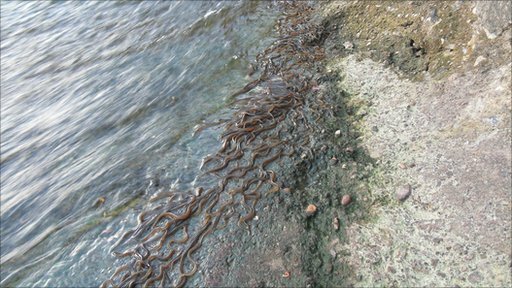 A Tewkesbury man has photographed hundreds of elvers attempting to swim up the River Severn. John de Wet noticed the young eels at the Upper Lode weir at 8.30pm on Sunday, 25 July, 2010. 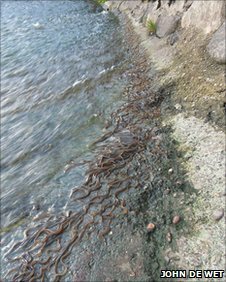 "These are excellent pictures demonstrating typical elver behaviour," said Andrew Kerr, trustee of Gloucestershire Wildlife Trust and with a particular interest in eels. "It is a particular phenomenon when they are gathered in large numbers that they slither over each other in order to climb up obstructions such as a weir. "They can even climb up vertical surfaces like this." The European eel (Anguilla anguilla) has a particular association with Gloucestershire. During its youth, as an elver, it lies in the River Severn and years ago, the banks would be lined with fisherman at night, trying to catch eels and elvers to eat. There are so few elvers in the river now, making them an expensive delicacy and many of them that are caught in the Severn today are sent to the Far East. The eel is an important food source for a number of species of high conservation concern such as the otter and bittern. The complicated life cycle and migratory habitat of the eel was a mystery for many years and there is still much to learn about the species. They spawn in the Sargasso Sea and make their way on a three year journey across the Atlantic as larvae to return to rivers in the UK as young eels. For the next four to ten years they grow and change in form and colour and make the long journey back to the Sargasso.